Infinity 4D lets you play with optical phenomena known as moire or interference patterns. You can create security features like 'hide & reveal' for brand protection, authentication and validation, where complex images are only visible with the corresponding lenticular lens overlaid on top. The very nature of it's creation makes it extremely difficult to copy. it's effects can be truly awe-inspiring, imagine such wonders as thin oil films on water effects, metallic and foil effects without the need for hot or cold stamping foil, metallised films or metallic ink spot colours. Mind blowing swirling patterns exhibiting continuous streams of colour, depth and motion. The results are truly spectacular and the only limitation is your imagination. 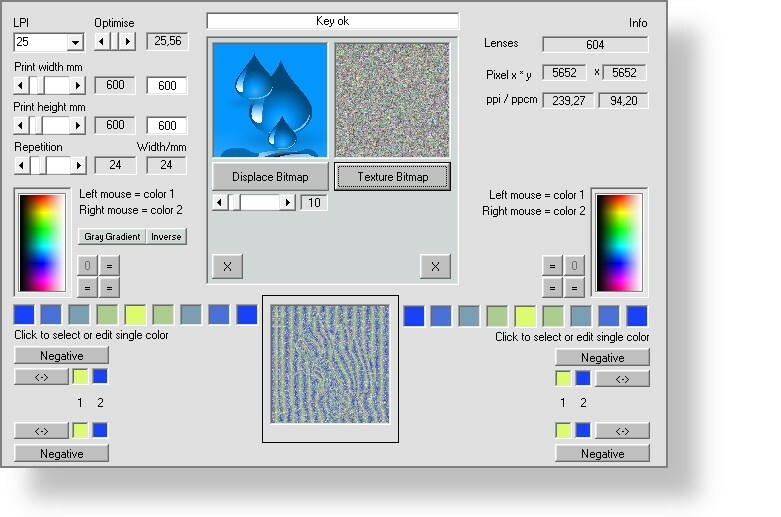 You can select the colour pairs for the 4 corners of the effect image and load a texture in png format with an alpha channel as image overlay. With a displacement map, the effects image can be encoded so that its contents can only be seen with a corresponding lenticular lens overlaid. Such images are suitable for use in product and trademark protection as well as in the validation of short-term products requiring protection (tickets, etc.). Among other things, This technology has been used to secure ballot papers and customs seals. 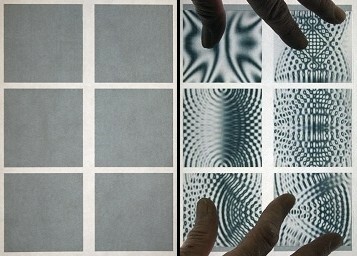 The images below, left and right show Infinity 4D images printed and then overlaid by a corresponding lenticular lens the reveal or 'decode' their content. The image on the right (although a digital display isn't the best medium to convey the true effect) is an example of a pseudo metallic effect. 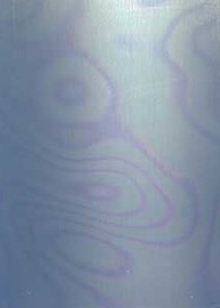 Since the metallic effect only arises in the viewer's perception, such images can be printed using all printing technologies and techniques without the need for spot colours . Infinity 4D is suitable for the production of high quality printed products,such as packaging mateials, boxes and cartons, jewellery labels on very fine lenticular films, or also decorative wall designs on very coarse lenticular sheets. It is also a process that lends itself well to high speed production due to it's repetitive nature, perfect alignment does not have to be achieved. Infinity 4D still requires the use of a lenticular lens to achieve the effect, but very fine pitch low cost PETG, PE and even PP can be used. With the right equipment (generally UV screen printing) it is also possible to 'print' a lens, so that 'spot' or specific areas of Infinity 4D lenticular effects are possible within a normal printed piece. Infinity 4D designs can also be used effectively as 'fill' patterns provided their rendered resolution is not altered. Meaning you can pull them into design software and apply them just as you would a normal fill pattern. Metallic effects is just one possibility. Using Infinity 4D is only limited by your imagination.